NEW YORK, NY--(Marketwired - Apr 8, 2016) - SolidOpinion, the leading commenting solution for web publishers worldwide announced today web publication Next Big Future is trending now with over 41 comments on article titled, "Russia Ramping Up Full mass production of various Armata vehicles from 2017-2020"
The SolidOpinion easy to use commenting plug-in platforms encourage readers to engage on-page content increasing average time spent per page and then during the same session encouraging that commenting reader to socialize their opinions of your content to their base, instantly converting visitors into a social influencers. 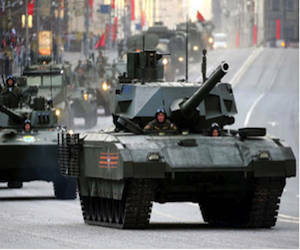 SolidOpinion commenting platforms take the average article like the above piece 'Russia Ramping Up Full mass production of various Armata vehicles from 2017-2020,' turning content from static one-time engagement per reader to dynamic conversations pieces generating potentially 100+ times the reader engagement per published piece. Effectively monetizing and uplifting online newspapers, online magazines, portal, blogs and more with interesting, fun and simulating conversation add-ons for readers who look at certain content and articles as conversation starters and want to keep that topic of conversation going -- feeding sentiment and turning visitors from readers to social influencers distributing their options of engaged publisher content to their network. SolidOpinion is the leading commenting solution for web publishers worldwide. The company's core product is a fully customizable discussion platform that generates revenue, traffic, data, and deep engagement for websites, while eliminating trolls. The company launched 3 years ago and its enterprise scale commenting platform is live across hundreds of publishers in 14 countries and languages, doing hundreds of millions of monthly impressions. ** News, Media, PR and Content distribution provided by 1-800-PublicRelations, Inc.